The Oklahoma Oklahoma Employment Security Commission requires all Oklahoma businesses with employees to prominently post a number of labor law posters, covering topics such as the minimum wage, health & safety, and other important labor laws, in the workplace. You can download or print all of Oklahoma's mandatory and optional labor law posters on this page, free of charge. 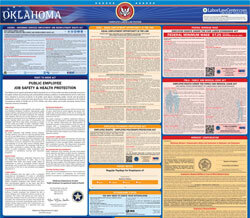 The appropriate state posters can be ordered for FREE from the various sources listed on http://www.ok.gov/oesc_web/Services/Employment_&_Training/Labor_Law_Posters.html. OK All-In-One Labor Poster: Instead of printing out dozens of posters, employers can also purchase an all-in-one poster that covers both Oklahoma and Federal poster requirements by clicking here . The Oklahoma Oklahoma Employment Security Commission requires that all employers post these one mandatory labor law posters in a prominant area within the workplace. Most Oklahoma businesses will also need to post the Federal Department of Labor's mandatory posters in addition to these state posters. Employers are required to post certain state and Federal posters while others are optional. Employers please note: Do not be mislead by solicitations requiring payment for these posters. They are provided FREE from the sources below. Instead of printing out pages of mandatory Oklahoma and Federal labor law posters, you can purchase a professional, laminated all-in-one labor law poster that guarantees compliance with all Oklahoma and federal posting requirements. Fully updated for 2019! There are an additional five Oklahoma labor law posters that are either optional, or mandatory only for a certain type of employer. Be sure to check this list carefully to see which posters are relevant to your business. General Labor Law Poster Your Rights Under the Oklahoma Minimum Wage Act All Employers This poster, which shall be posted in a conspicuous area for all employees to read, gives details for employees of their rights, and employers of their liabilities according to the Minimum Wage Act. General Labor Law Poster Unemployment Insurance All Employers This poster, which shall be posted in a conspicuous area, informs that if you lose your job or if you work less than full time and get less than your full time wages that you may be entitled to receive unemployment insurance benefits. General Labor Law Poster Oklahoma Workers' Compensation Notice and Instruction to Employers and Employees All Employers All employees of this employer who are entitled to benefits of the Administrative Workers' Compensation Act are hereby notified that this employer has complied with all rules of the Workers' Compensation Commission and that this employer has secured payment of compensation for all employees and their dependents in accordance with the Act. General Labor Law Poster Public Employees Have a Right to a Safe & Healthful Workplace Public Employers The Oklahoma Occupational Health & Safety Standards Act of 1970 provides job safety and health protection for public workers. Rules have been adopted which include both employer and employee responsibilities. These include state, county, city and public school agencies and certain public trusts. Spanish Language Workers' Compensation Notice (Spanish) All Employers This poster, which shall be posted in a conspicuous area for spanish employees to read, informs them of their workers' compensation benefits. Spanish Language Your Rights Under the Oklahoma Minimum Wage Act (Spanish) All Employers This poster shall be posted in a conspicuous area for all spanish speaking employees to read. This poster informs employees of their rights under the Oklahoma minimum wage act. Printed all of your Oklahoma labor law posters? Be sure to check out the free federal labor law posters page to ensure that you comply with Department of Labor mandatory posting laws. Disclaimer: While we do our best to keep this list of Oklahoma labor law postings up to date and complete, we cannot be held liable for errors or omissions. Is a poster on this page missing or out-of-date? Please let us know so we can fix it!